The U.S. dairy industry has a great story to tell so let’s use our collective voices to go global with it. We have in the past talked about how stable our year-round supply is and how we are prepared to produce more. That's obviously a positive story. We've also emphasized the safety of our product, which is incredibly important. Another important point to emphasize more as part of our global message is that we sustainably produce this product as well. We're using a lot less water and a lot less land with fewer inputs to produce way more milk. We are sensitive to reducing greenhouse gases and we have the FARM program that's focused on sustainability and animal welfare. These are incredibly important points for us to emphasize as we continue to market our exports. Last week, the Innovation Center for U.S. Dairy recognized Sustainability Award winners for their commitment to improving the well-being of people, animals and the environment. The winners of the 2018 U.S. Dairy Sustainability Awards are, from left to right, Austin Allred of Royal Dairy, Sarah Beaubien of Tillamook County Creamery Association, Brett Reinford of Reinford Farms, Ted Sniegocki and Bob Joblin of Magic Dirt, Mike and Edie McMahon of E-Z Acres, and Lisa Zwack and Erin Sharp of The Kroger Co.
You can see the winners above. A complete list is at the bottom of this article. 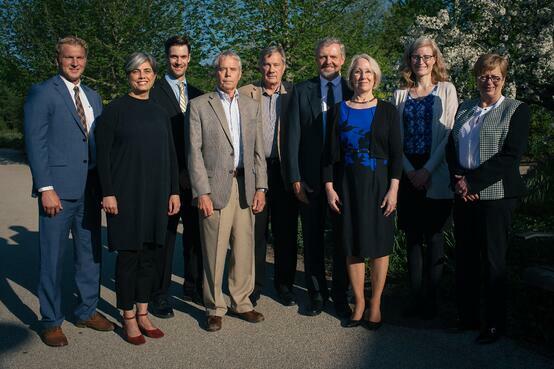 These people represent farms and dairy companies that show the kind of innovation and creativity that can spark ideas in others and help the industry continue down the road to greater sustainability and efficiency. Thanks to advanced cow care, genetics and nutrition, our dairy farmers produce more milk from fewer cows—requiring a lot less water and less land—than they did 60 years ago. In fact, more milk is produced today with only 9 million cows than with 26 million cows in 1944. According to Cornell University, the dairy industry reduced its "carbon footprint" (methane and carbon dioxide emissions) 63 percent between 1944 and 2007. A lot of people think that “sustainability” relates mainly to resources such as water, land and energy, and while that is an important component there is more to it than that. It’s really a healthy balance between using resources efficiently while meeting a societal need (i.e., food production). We must make it economically viable for dairy farmers and processors. 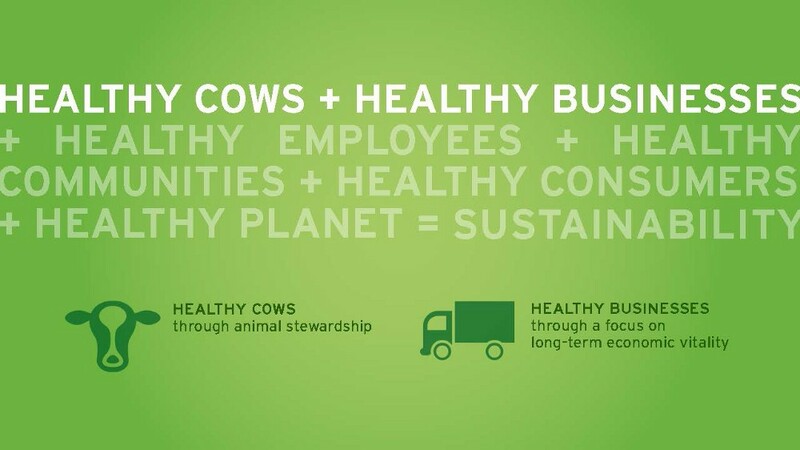 Invariably, dairy farmers have found that when they commit to sustainability, there is a positive economic return because they are using resources more efficiently. Quite simply, sustainability boils down to producing food more efficiently so there is enough to go around. For example, I'm talking about more bushels of corn per acre with less water, fewer chemicals and other inputs. It's all about getting more production out of each acre of land. Continued improvement will be needed for the U.S. dairy industry to expand milk production — and exports — to feed a growing world population. The current world population is 7.6 billion and the United Nations projects it will be 9.8 billion by the year 2050. Higher living standards will increase demand by a higher percentage than just population growth alone. Food production must increase by 50 percent or more to feed that many people. U.S. dairy is part of the solution. As Greg Miller, chief science officer for the National Dairy Council, points out in a guest commentary for The Chicago Council on Global Affairs, "The health of future generations is linked to the health of our planet, so sustainable diets must be at the core of the global response." As we salute the U.S. Dairy Sustainability Award winners listed below, let's work together to communicate our positive story to the world. For more details on this year's winners, click here. Download the news release here. Tom Vilsack is president and CEO of the U.S. Dairy Export Council. He is a former U.S. Agriculture Secretary and governor of Iowa. U.S. Suppliers Up the Ante for Dairy Sustainability.